As promised in Part 1 of this series, I’ll now reveal the worst ingredient in our food. It is our complacency toward it. The first toxic thing we put on our plate is our lackadaisical attitude about the next thing we put on our plate: our food. But how do we go about changing this first dangerous ingredient? Where did this ingredient even come from? And how do we proceed? Having a journal can help you organize your time, but I doubt you are keeping a journal, even though it would help you account for how you are spending your time. On the other hand, if you had the time to keep a journal, you likely would have already organized your time. If you felt you could afford to eat healthier food, you might already be doing so. So, by avoiding the extra expense now, you are likely making a trade that will result in doctor bills later if they are not already stacking up. Many people know this, but recognizing this as a dilemma and knowing how to break out of it are two very different things. These cyclical patterns feed themselves and are difficult to disrupt. When I was in grade school and the kids used to jump rope, we would use a very long rope. One child on each end would “twirl” the rope. The children about to jump in would hold their hands, palms out, in front of their chest, mimicking the placement of the rope. This hand motion would help them to get a feel for the rhythm of the rope as it rotated in front of them, until they had a good enough handle on its timing to jump in. They would then jump into the middle of the rope, and continue jumping until they missed, when they were given one end of the rope to become the new “twirler.” Then, the next child in line would take a turn jumping. The trick for these children was standing in front of the rope before they jumped in, calculating the rhythm. They assessed for a moment, deciding how to insert themselves into the cycle of the rope so they could jump within the rhythm as it rotated around them. It didn’t always work on the first try. But anyone who kept trying got it eventually. However, it took finding that starting point, when they could jump in while the rope was still moving. That is much like what we must do regarding our current food cycle: stand back, assess the situation, find a place we think is a good starting point, and jump in. As I’ve already stated, the first dangerous ingredient in our food is our attitude toward it. By this, I’m obviously also saying we need to gain a new perspective regarding our food. It seems the best place to start is at the beginning: the place where we obtain our food. For most of us, this would be local chain grocery store; for the sake of relating to the average consumer, this is where I will begin this leg of our journey. Consider average shoppers, who are balancing all the responsibilities of daily life. Take a moment to relate to what is happening in their minds. How do they select purchases for their families? What criteria factor into getting an item off the shelf and into their shopping carts? Many of us don’t even realize that the scene has been set long before we even lay eyes on the food for sale in these places. Think about it: When you walk into a grocery store, you usually enter through the produce department. These displays feature the freshest of all the ingredients in the store. You’re immediately surrounded by products that appear to be garden fresh, and your line of vision is immediately flooded with overhanging, billboard-sized pictures of food that looks fresh, healthy, and appetizing. The produce department sits beneath these larger-than-life images displaying fresh-cut tomatoes of only the highest quality, placed directly beside succulent cuts of the greenest broccoli. Nearby might hang another photo of lettuce, freshly pulled from the garden and so recently rinsed that its leaves are still wet. Moving farther into the grocery store, you’ll see that over the meat department hovers a picture depicting fresh, lean cuts of only the pinkest prime meat. Over the dairy section…well…you get the picture. When you see the bright red and orange packaging (colors scientifically found to rouse hunger[i]) splashed with images of young, teenaged boys having an adventurous time on a mountain bike or a skateboard, you might be intrigued by the excitement suggested on the packaging and think, “That looks like fun. I’ll bet the kids would really enjoy these. I’ll just get one or two bags to treat them with. After all, they are such good kids and they deserve a treat.” At this point, you’re more aware that what you’re purchasing isn’t healthy, but you justify it by thinking, “The rest of what I’m buying is healthy.” Unfortunately, what you’ve done, without even realizing it, is embrace an unspoken message sent by the images that surrounded you within your first moments inside the supermarket. These images, which you unknowingly adopted, caused you to espouse a “safe” feeling that you have now applied, ever-changing as it may be from item to item, throughout the entire store. That standard of quality, however, was derived from a quick glance at something as simple as a picture of a sliced tomato and wet lettuce, and was presumed within your own mind; it is not guaranteed anywhere within the store. As you progress through the store, you apply the self-implied safety standard to more and more of the products until, inch by inch, you’ve covered the entire store and made selections from each aisle. The appealing images of groceries are placed strategically to coerce you into feeling at peace with the items in front of them on the shelf. It makes sense: You buy when you feel safe, and the hidden messaging that greets you at the door can carry its rationale through all the decisions you have made until you are loading the groceries into the trunk of your car and then driving home to feed it all to your family. WATCH THE FIRST TV PROGRAM! As stated before, the most dangerous ingredient in our food is our attitude toward it. When that changes, we can begin to make progress. We have to undo what brought us to the point we’re at in order for this to happen. Part of the solution is to face that we have been seduced over time by complacency, exhaustion, and the urge for convenience in a world that keeps us busy. But, there’s another angle we need to explore. Food is not emotional, nor is it entertaining. Advertising is. That soup looks warm and delicious. Life was hard today. I want that soup to make me feel better. I’m bored. Those chips look fun. So do these cookies. I feel lonely and neglected. This “indulgent, luxurious” chocolate looks seductive. But herein lies so much of our problem. We want food to make us feel better. We want food to supplement the satisfaction we’re not getting from a dead-end job or the fun missing from a lackluster social life. Worst of all, the food is making us feel worse (more on this later). On top of that, when we gain weight because of the food choices we’re making, many of us withdraw, keeping further to ourselves…and that feeds into our disappointment with our social lives which lowers our performance at work. See the cycle? It’s only one of many wrapped up in the complicated subject of our food. Food is fuel. This is a simple fact. We absolutely have to let go of the tendency to link our food with our emotional experience. Think about it this way: If your body was a machine and required batteries, hydraulic fluids, and certain amounts of lubricating oils at specific maintenance intervals, would you put more of these products in it than necessary? I doubt you would add foreign substances that weren’t on the maintenance instructions, just for “fun” or for any other reason connected to emotions. You would likely presume that doing so would interfere with the machine’s operations. Our bodies are no different. We need a certain amount of nutrition at intervals that create our optimal performance. Another complication is the foreign substances we regularly put into our bodies. That causes us to suffer, to become “out of whack,” just as a machine would do under similar circumstances. We also need to change our ideas about food being instant. That’s not to say there isn’t “instant food,” but typically, those products have no nutritional value. Worse, many are loaded with toxic ingredients (this will be outlined in a later chapter). Since the introduction of processed food, our disease rates have skyrocketed. Whether we realize it or not, this is another byproduct of our complacency toward food. You might think I’m being harsh, but I don’t mean to be. I’m not saying this from a place of judgment (remember, I have spent the last fifteen years dealing with chronic illness); I just know that many people don’t realize how harmful these processed foods are. When we emotionally separate ourselves from our food, we realize what our food is not. Next, we must rethink what our food is. We must remember its purpose. When we emphasize that food is fuel for our bodies and not entertainment or emotional satisfaction, we’ll adjust our priorities accordingly. And when this happens, we’ll realize that it is possible to create more time in our schedule for proper nutrition. We’ll begin to safeguard with more diligence what we are buying, and we’ll discover ways to afford better food. We will change our expectations of the finished product and be satisfied with food in its nutritious simplicity. If you feel tempted to abandon this series and return to old habits at this point, I understand. But before you do, I urge you to remember that this would likely be an emotional reaction founded in fear and lack of confidence, as this broad subject, as stated previously, can easily become overwhelming. Your health and the health of your children could depend on whether you keep reading. It is understandable if feeling overwhelmed tempts you to decide not to think about this enormous issue. Believe me, I’ve been there, and there is hope! I, for example, was the last person anyone ever expected to learn how to cook, plan meals, or stick to a specific meal structure. However, my health eventually declined to the point that my diet demanded my attention, regardless of what I may have perceived my priorities to be. Now I prepare nearly all my family’s meals and have really learned to love reading labels and knowing what we put into our bodies. I now find joy in cooking! That transformation highlights the purpose of this series and the upcoming book TIMEBOMB: to shed light on a path that was shadowed in confusion when I was on my journey, and to simplify the transition for the reader. I challenge you to take charge of your situation: Learn how to become your own vigilant guard. If you try, you can take the emotion out of the equation and begin to make purchases based on the principle that the food you eat is fuel. You are your primary advocate. As a wise consumer, you can be part of the solution. You’re not powerless, and you don’t have to be a rocket-scientist-health-guru-organic chef to change the way you and your family eat. 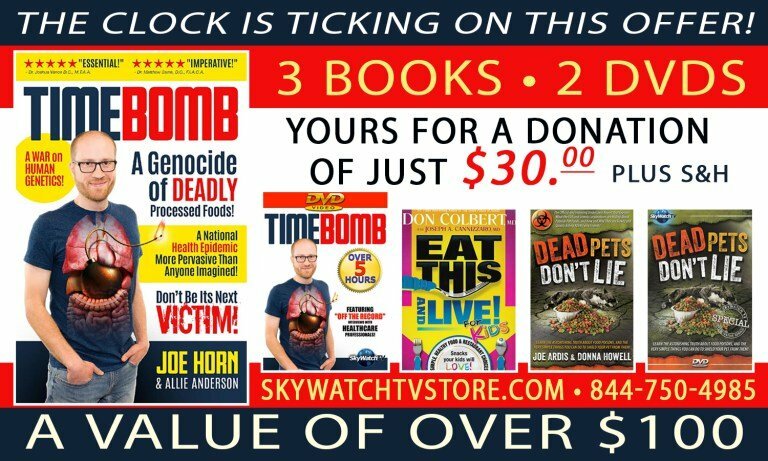 In TIMEBOMB, we will discuss the dangers in your food, how to watch the ingredients on your food labels, and how to use your money to cast your ballot each time you shop. The transitions you make can be gradual. This doesn’t need to happen overnight. On the contrary, if you are the type of person who has trouble following through when a change has been made too suddenly, then I encourage you to approach this process more slowly. The important thing is to take steps toward your goal. If you’re determined, you can, even on a shoestring budget and with a cramped schedule, begin to overhaul your family’s eating habits. There are forces that want you to stop reading this series. Like Cipher from The Matrix, choosing to swallow the pill that would allow him to go back into a false sense of reality where his life is not his own, but where he is more comfortable, you may find yourself wishing you had taken the other pill. My illness did not allow me that luxury. I hope you’ll never find yourself at the point I reached. I pray that you will take this information and use it as a critical preventative measure for yourself and your family. If you’re already ill, then believe me when I tell you that I’ve learned firsthand that chronic illness often can be reversed, once you eliminate from your lifestyle the things that are making you sick and introduce good things that your body needs to heal. I implore you as a responsible individual, and as one who presumably values your health, as a concerned member of a society being kept sick by conspiracies that line the pockets of the wealthy elite (more on this later), or even as a parent: Please don’t stop reading this series and go back to your old habits. Knowledge is power, and by the time you reach the end of TIMEBOMB, you’ll understand how to reclaim yours. [i] Taylor, Delano. “The Psychology of Colors.” Daily Infographic, 19 Sept. 2012, http://www.dailyinfographic.com/the-psychology-of-colors-infographic. Accessed 19 Dec. 2017.